With Quickflirt.com, love only takes a minute to find. All you need is a brief wink or a quick comment to get the ball rolling. Established in 2007, this is a dating platform which has rapidly become the place to be for casual dating and fun, playful encounters. There are some really useful features, such as the “flirt box” which allows you to flirt with multiple users at once. The ability to tailor your profile to “normal,” “naughty” or “no limits” mode leaves you in total control. The emphasis at the QuickFlirt dating site is fully on getting in touch with other users and interacting. So it’s no surprise that there are plenty of options for communicating including suggestive “winks,” instant chat, video chat and SMS chat. All of these options allow you to be in direct and instant contact with other people. And if you want to declare your interest in multiple users, then the “flirt box” lets you do just that. There is nothing complicated or time-consuming when it comes to signing up at QuickFlirt. You will simply be asked for some basic information, including gender, date of birth and location. Having submitted a valid e-mail address, you will be sent a verification e-mail message before you can proceed. Having done this, you will be prompted for a screenname, a very brief status which summarizes what you’re looking for and the age of user you hope to find. Finally, just add a photo and you are ready to flirt. One of the most effective security devices is the e-mail verification on sign up, as it ensures that only genuine users can become Quickflirt.com users. However, if you do encounter any problematic action, then there is a very convenient “report” button on every page which gives you direct action to site administrators. There is also an option to turn your profile on or off, which means you can use the site anonymously if you wish. In addition, it is well worth checking out the page devoted to safe dating tips. As a free member, you will be allowed to browse the site. But if you actually want to flirt and have some cheeky fun with other users, then we recommend becoming a paying member. 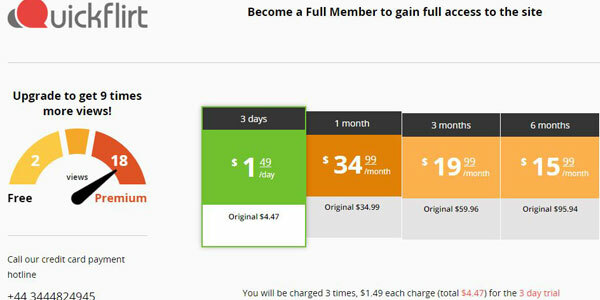 You can try out the service in a 3-day trial, which will only cost you $4.47. The Quickflirt prices for a 1-month commitment will cost $34.99, a 3-month deal works out at $19.99 per month while a 6-month package costs $15.99 monthly. The site has a very useable interface, which is perfect for a platform which encourages instant connections. It is simple to use while being eye-catching at the same time. 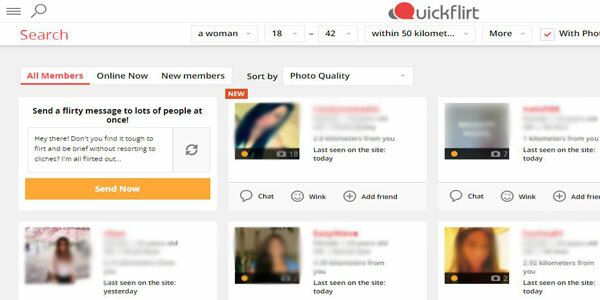 As any QuickFlirt review will tell you, the focus is most definitely on contacting other users. And so potential matches dominate your personal dashboard. You can either click on the profiles to learn more or simply hit the “Chat,” “Wink” or “Add Friend” buttons straight away in order to interact immediately. Other useful features include the messages and chat icons in the top right corner which provide access to your communications history. In addition, there is also a search bar which allows you to conduct a user search directly from your own dashboard. Conveniently, there is also a mobile version of the site which means that you need not miss a single flirt or naughty notification, wherever you may be. Because of the emphasis on instant contact, you will have potential matches placed in front of you every time you log in to your account. However, if you want to take the search into your own hands, then Quickflirt also has a very solid search function. The basic search allows you to find someone based on general criteria such as age and location. If you want to be more specific in your quest, then the advanced search presents you with tens of options. They include religion, education and for a flirty dating site, the all-important physical attributes such as eyes, hair, body type and tattoos. All in all, whatever you are looking for, there is plenty of scope to find it. You can always find great casual fun at the very best general dating sites such as Zoosk.com. If that sounds like a site more fitting for you, check out our Zoosk review. But, if you are looking for a platform that is dedicated to winks, saucy messaging and naughty chat, then QuickFlirt.com is the best option out there. The entire concept is designed to put you in touch quickly and directly with other users to have fun. And with some great features such as the “flirt box,” the cheeky action is just a few clicks away.